In the latest of our New Year’s resolutions series, I chatted with Tesla CEO Elon Musk about his goals and resolutions for 2012. While most of his efforts will be on getting the company’s electric sedan, the Model S, to the first customers in July, Musk told me that Tesla plans to unveil the Model X — its third car, which is an electric SUV — at an event on February 9th. Musk says in our interview that he thinks the Model X “will be very well received.” Tesla raised hundreds of millions of dollars in a second share sale last Summer partly to fund development of the Model X and last year Tesla said it was looking to bring the Model X to the first customers in late 2013, and would shoot for 15,000 units per year of the Model X starting in 2014. 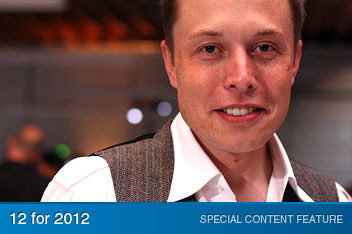 To read the rest of Musk’s goals and resolutions for 2012, check out our New Year’s package. The X will be huge! Has anyone seen updates from Tesla the program for Model S and “third-party apps and text-to-speech” Musk announced last September? It’d be great to get some details so Cleanweb Hackathon participants could look at building apps later this month in NYC. I wonder what skeptics will say when Elon gives the US that nice big luxury SUV with three rows of seats that doesn’t cost 80$+ to fill up and has kickass performance to boot.